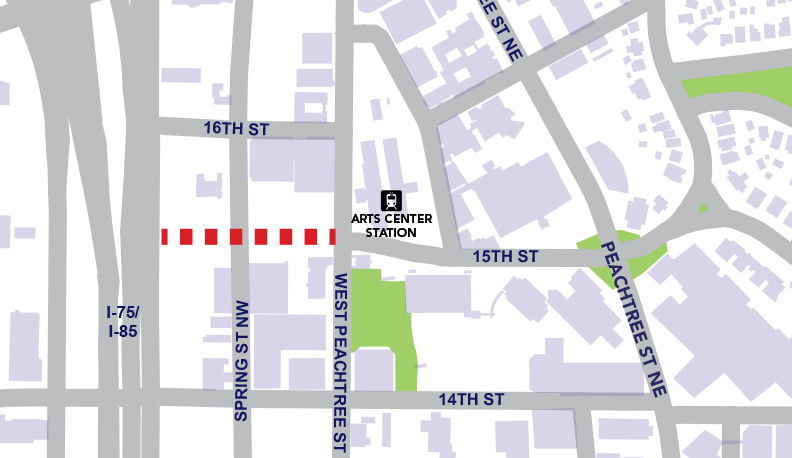 This project would be a multi-modal connection that extends 15th Street from its current end point at West Peachtree Street two blocks west to Williams Street. The entire extension would be implemented on GDOT right-of-way, eliminating the need for costly and time-consuming land acquisition. The proposed roadway design between West Peachtree Street and Spring Street would include a three-lane section consisting of one through lane in each direction and dedicated left-turn lanes approaching Spring Street and West Peachtree Street. 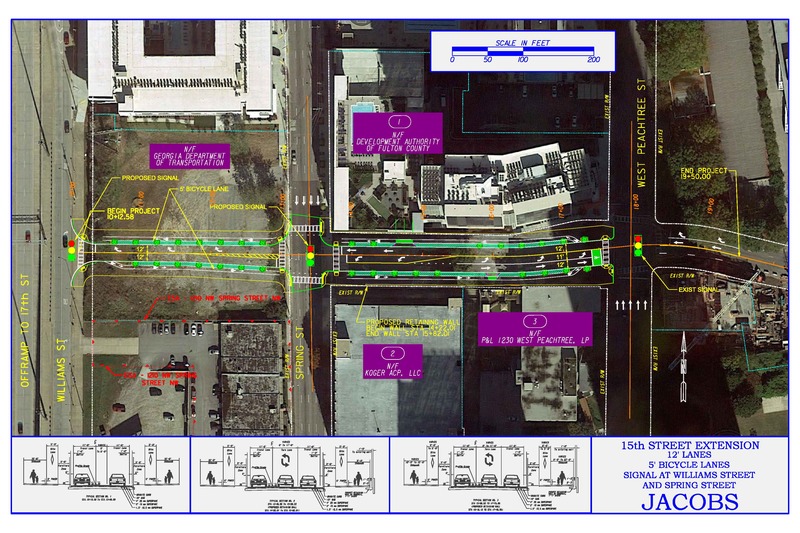 The proposed lane section west of Spring Street would consist of a single through lane in each direction. Travel lanes are proposed to be 11-feet wide. Additionally, the new cross-section would consist of 5-foot wide bicycle lanes in each direction, a 5-foot tree planting/furniture zone, and a 10-foot sidewalk. The bicycle lanes would provide a direct connection to the Arts Center MARTA Station and existing and proposed developments as well as other bicycle routes. In November 2018, Midtown Alliance, in partnership with the City of Atlanta, shared the concept design of the 15th Street Extension Project with the public to solicit feedback. The project team received input from the public, key project stakeholders, and the City of Atlanta that the project would be improved by providing a safer bicycle facility. The team responded by revising the concept design with the bike lanes at sidewalk level so as to provide vertical separation between cars and bikes. 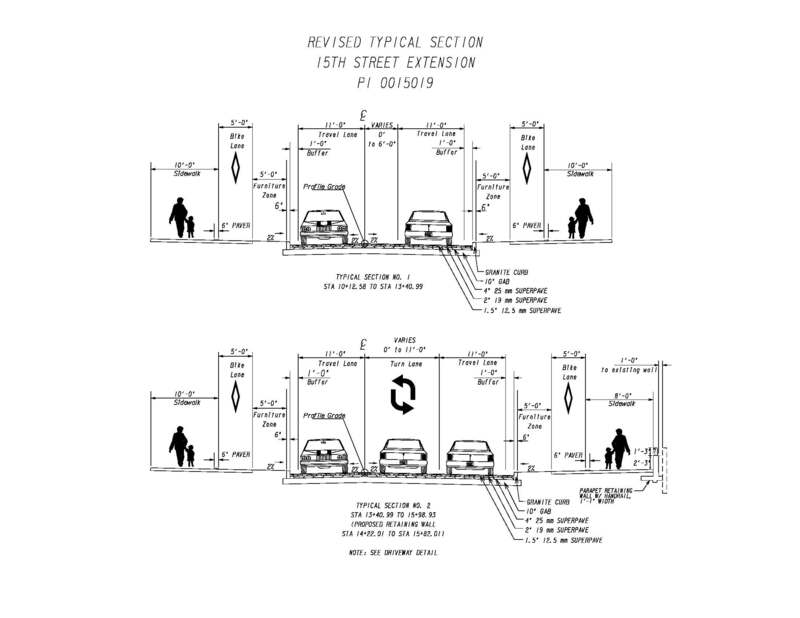 With this revised proposed design, separation between cyclists and pedestrians will also be critical and these design details will be resolved during the next phase, preliminary engineering. Before advancing to the next stage of design, the project team requested feedback from the public on the revised design proposal. Comments were received via an online form or email between April 4 and April 17, 2019. All comments received, including responses, will be posted to this webpage in the coming weeks. Midtown Alliance was awarded grant through ARC for Design/Engineering to extend 15th Street from West Peachtree St. to Williams St. In partnership with GDOT and the City of Atlanta, an RFQ for Engineering Design services was advertised in June 2017. Jacobs was selected as the lead consultant and design work began in early 2018. Environmental and traffic studies and Concept Design review and approval are underway with GDOT. Pending approvals and permitting, construction of the extension is targeted to begin in 2020. Midtown Alliance hosted a public information open house on November 8 at 999 Peachtree Street. Midtown Alliance and the project design team shared conceptual designs for the proposed 15th Street extension project and solicited feedback from attendees on the proposed concept. The open house provided an opportunity for the public to engage with Midtown Alliance staff and the designers to both learn more about the project and inform project design before it progresses to the next phase of development. Display Boards from the open house are available for download. Responses to comments received, both from the event, online, and via email, are available to read in this document. Comments received from this event have led to revisions to the original design (as presented in the display boards). Please see the above call out box for details about these changes. Please stay tuned for project updates! If you have general comments or questions, please contact transportation@midtownatl.com.